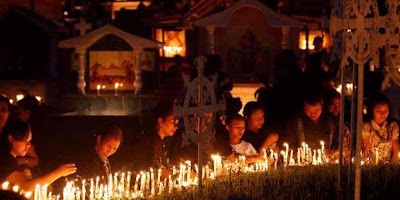 Larantuka town is located on the eastern tip of Flores Island, on Thursday (05.04.2012), from crowded Catholic pilgrims from various parts of East Nusa Tenggara to follow the Good Friday procession in the capital city of East Flores. Portugal's Ambassador to Indonesia Carlos Manuel Leitao Frota was present with his wife Mrs. Arlinda Chanves Frota, Tourism and Creative Economy Minister Mari Elka Pangestu also entourage had arrived in Larantuka to follow the religious traditions of the Portuguese heritage that on 6 April 2012. Currently, local Catholics are conducting activities "tikan turo" or plant wax poles along the highway route into the Good Friday procession the next day (Friday, 06/04/2012) in the old city Larantuka located at the foot of Mandiri mountain . While other Catholic pilgrims, on Thursday morning had crossed to the Adonara Island that is located in Larantuka shore by boat and motor boat to make a pilgrimage at Chapel Wure. Wure Chapel, stood erect a statue of Jesus - Larantuka call “The Lord standing” - while holding a rooster in the form of statues as well. Based on the historical narrative, the beginning was the statue of a young person who buys a rooster from a grandmother in the market. The young man had no money when buying chicken at the market, but it took the old woman went to a place to take the money. When the old woman arrived at the scene, the young man was transformed into a statue while holding the bird in his right hand. Local people believed to be the statue of Jesus which was then called in the local language "The Lord Standing". Ahead of Thursday afternoon, Larantuka is popularly known as the City Reinha Rosary, the eerie silence because of the activities being carried out "tikan turo" by the mardomu (such small committee that has been applied much earlier to the waiter on Friday) in accordance promesanya (vulture). When that, the activity in the Chapel of Mr. Ma (Mother Mary) begins with a ceremonial "Young Master" (opening the chest was closed for a year) by the officer conferia (an organization within the church body) that have been raised through the oath. Arca Mr Ma then cleaned and washed and dressed in mourning comes in the form of a coat of black, purple or blue velvet. Catholic pilgrims present at the time was given the opportunity to pray, worship, prostrate please thanks and blessings, which the petition would be granted by the Lord Jesus through the intercession of the Virgin Mary. After the chapel door was opened, the local people as well as Catholic pilgrims from all over started to engage in "kiss the foot of Mr. Ma and Mr. Ana" in an atmosphere of silence and sacred. Catholics outside the diocese Larantuka, just do the ceremony on Holy Thursday Mass to commemorate the Last Supper of Jesus Christ with his disciples before his death on the cross. In this ceremony, a Catholic priest must wash the feet of 12 laymen who had been appointed, as when Jesus washed the feet of the 12 disciples. The foot washing is a symbol of genuine service to others. Maundy Thursday is one of the Tri Holy Day for Catholics. It is called Maundy Thursday, as the liturgical color of the day was dominated by white color. Priests wearing white robes, ornate altar was all white as a symbol of glory and holiness. The name of Holy Thursday (Maundy Thursday) taken from the first antiphon of the foot washing ceremony which in Latin is called "Mandatum Novum" or a new command. Celebration of Holy Thursday Mass for Catholic churches in the Archdiocese of Kupang will be held at 19.00 pm. After Mass, the procession of the Blessed Sacrament is held available to be shared on Good Friday.